William Ratcliff, born: ? , died 1827 Kershaw SC. William Ratcliff was married to Sarah Parker, born circa 1786. Sarah Parker was the daughter of Josiah Parker, b: ? , d: ? Sarah Parker died 26 February 1864, Kershaw County SC. Samuel Ratcliff, born 1805 (confirmed, he was age 45 in the Census of 1850) in Kershaw County SC died about 1853. Had a Mill called "Old Ratcliff's Place" near Willow in Dallas Co., Ark. Samuel Ratcliff was listed as a farmer in Census records. He was in Mississippi by 1840, and later settled near Willow, in Dallas County AR. Samuel Ratcliff is buried in the Old Pleasant Hill Cemetery, also known as the Amis or Ratcliff Cemetery, Manning, Dallas County AR. Samuel Ratcliff married Permelia Emily Key on 30 September 1849. Permelia was born 30 July 1823 in Jasper GA or McDonough, Henry County, GA.
(she married 6 times during her lifetime) -- on April 19, 2012 I found a site that said she married Ervine Dunnahoe (her 3rd husband) again as her 7th husband. This doesn't seem to match a story I had some time ago about him being a rascally character (which is why they were divorced), however, the gravestone seen on FindAGrave.com does shoe Dunnahoe as her last name, so it would appear that she was a Dunnahoe at time of death. I could do a whole post just on Permelia. Sometimes her name will appear as Parmelia and Emily is from some sources shown to be a nickname from possible middle name Emaline. By the dates of the children's births, we can tell that the family moved from Michigan to Arkansas between 1842 and the date of the census in 1850. 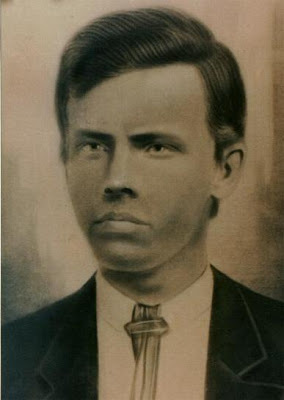 Samuel Ratcliff and Parmelia Key were the parents of Marcus LaFayette Ratcliff, [pictured?] born 15 Jan 1851. In 1875, Lafayette married Ann Porter. Ann or Anna Porter was born sometime between 1852-1855 in Arkansas. She died in 1932. According to the 1880 Census records, Marcus Lafayette Ratcliff went by the name Lafayette Ratcliff. His occupation listed as a farmer. Marcus Lafayette Ratcliff died in 1897 and is buried in the Taylor Cemetery. Marcus Lafayette Ratcliff and Ann Porter had a son named Lewis Stanley Ratcliff. I have different names for him. Alternates names are Louis Stanley Ratcliff, Lewis Sidney Ratcliff, and Louis Sidney Ratcliff. Lewis Ratcliff was born 1876 in Jacinto, Dallas County AR. He married Amelia Elizabeth "Bessie" Lemons (some records show Amealy as her first name, but it should be Amelia) on 16 December 1906 in Arkansas. Lewis Stanley Ratcliff died around 1924, just a few months before the birth of his son, James Marcus Ratcliff. James Marcus Ratcliff was born 25 August 1924 in Leola AR. Died May 4, 2005 in Savannah GA from complications following a stroke. Ratcliff line compiled by Richard Ratcliff -Use the 'find' feature for Samuel Ratcliff.